Travel writers love to state the obvious: Tokyo is a fascinating mix of the new and the old. Robot-centered entertainment, Starbucks, an ancient temple, and fortune tellers may all be contained within a single city block. 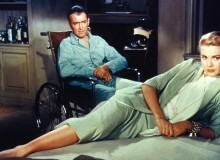 The ages run together, somewhat seamlessly. Yet very much like the 2011 Woody Allen film Midnight in Paris, where the main character longs for another era, sometimes we just want to step back into a simpler time. (A time where we weren’t constantly bumping into Pokemon Goers, for example). 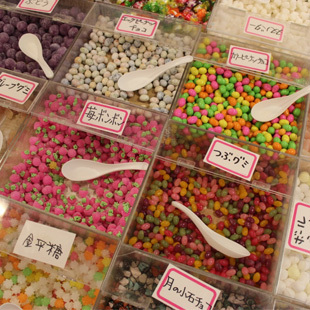 One surprising way to tuck into Japan’s past is to head to the shopping complex of Decks in Odaiba. Most of Decks comprises of trendy shops and restaurants, similar to the thousand other malls that seem to be squished onto Odaiba’s artificial island. However, above the virtual reality amusement park—Joypolis—lies a rather oddly-placed “attraction” of sorts—Daiba 1-chome Shotengai. This street pays homage to Japan’s Showa era (1926-1989), with its kitsch vintage shops, arcade games, and attraction replicas. Though the Showa era spans several decades, the street seems frozen in the 1950’s and 60’s—a nostalgic time for Japanese residents and retro collectors alike. The vintage bits are fun to hunt down along the Shotengai. Several vending machines and storefronts sell old-timey candy and snacks, including a very colorful and classic penny candy station. 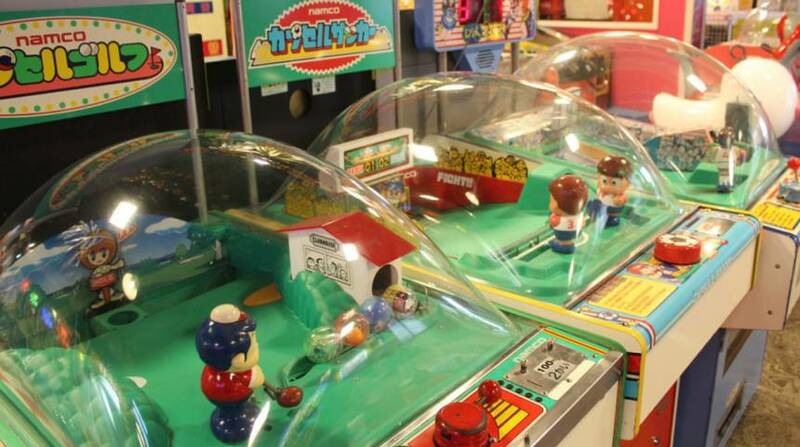 The retro game arcade, called 1-chome Playland, is especially popular for visitors. 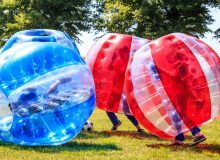 It’s here that you can play a range of analog games, from pinball machines to early racing video games to whack-a-mole. Walking further down the Shotengai, you’ll come across more appropriately-placed relics. A replica of the first Shinkansen—released in 1964—pokes out from one wall, next to the elevators that whisk you back to the present, if you so desire. 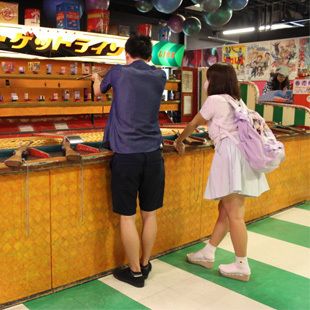 A shooting gallery—for patrons 18 years and older—entices visitor to win one of the vintage snacks moving along a track (5 balls for ¥300). Several shops have a mix of retro and current souvenirs. That is, Hello Kitty and Disney characters make their due appearance, alongside naughty-worded boxers and Japanese-themed bandaids, tea bags, and tissue boxes. Though not everything is strictly retro, I found that the range of souvenirs were quite unique compared to other tourist sites in Japan. (Vegetable pen anyone?) Other parts of the Shotengai include a school-themed haunted house (¥800)—more for teenagers than adults. The Takoyaki (octopus ball) Museum also resides at the end of the street … if that’s your thing. Daiba 1-chome makes for a welcome detour while submerged in retail hell. Grab a glass bottle of Coke, challenge a friend to a video game that actually requires strategy, and make yourself at home in the past. 1-6-1 Daiba, Minato-ku. Nearest station: Odaiba-kaihinkoen. Shops open 11am-9pm; restaurants open 11am-midnight. 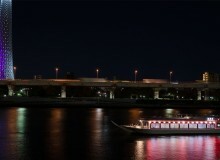 www.odaiba-decks.com/services/en.php.